This is Page 2 of 4 - the best of November 2016! 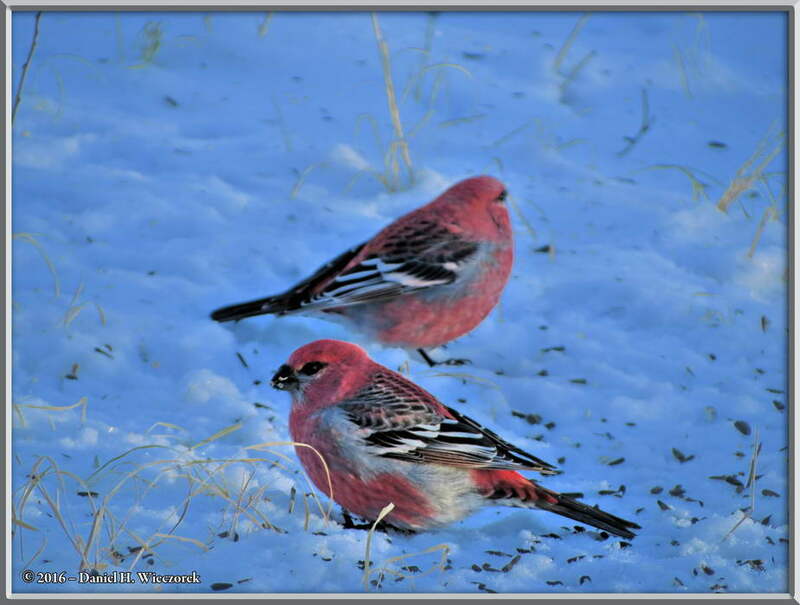 This page begins with November 13th and photos of Pine Grosbeaks (Pinicola enucleator). 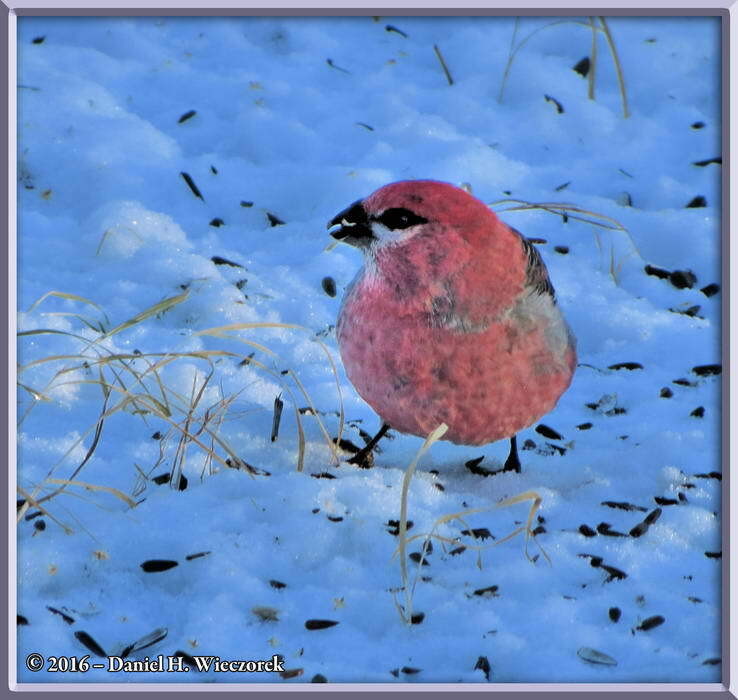 Bird photos are the predominant type of photo on this page, but there are also some interesting and beautiful snow shots and even some shots which were taken while we were out Cross-Country skiing on November 17th. Click on any thumbnail to begin. 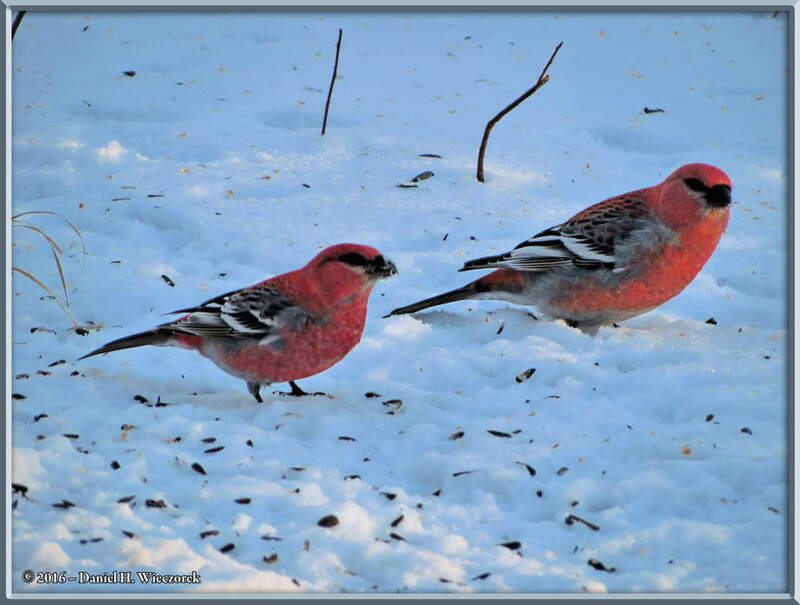 Here are three shots of Pine Grosbeaks (Pinicola enucleator). 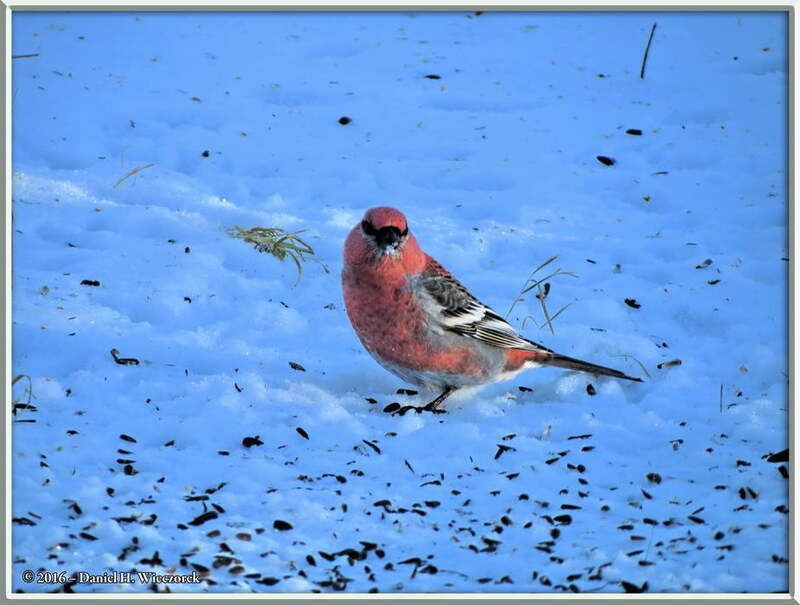 We had never seen this bird before this winter. 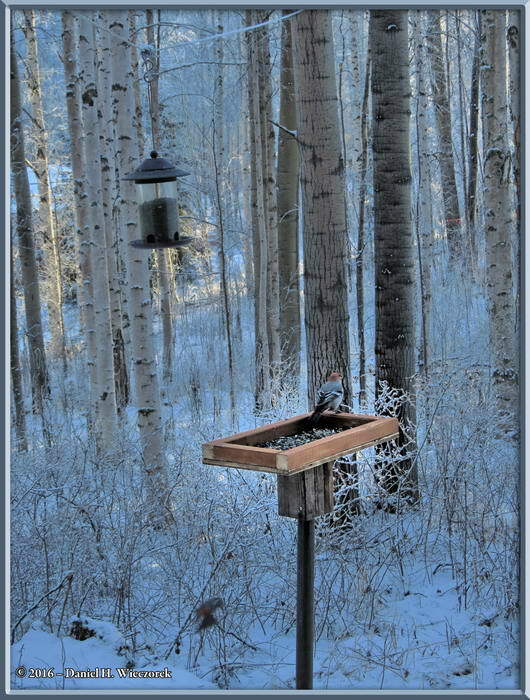 We noticed some of them on the ground under the hanging bird feeder (see photo in Row 9) trying to find Black Oil Sunflower Seeds which were knocked out of it by the Black-capped Chickadees. 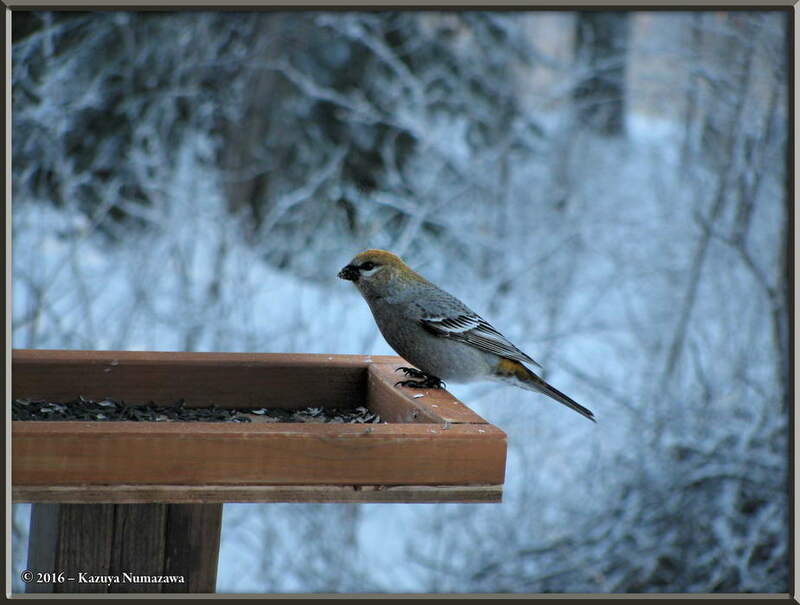 We saw one Pine Grosbeak trying to feed from the hanging feeder, but this bird is just too large to be able to succeed in standing on the lip and being able to bend over to get the seeds. All of these birds are males. 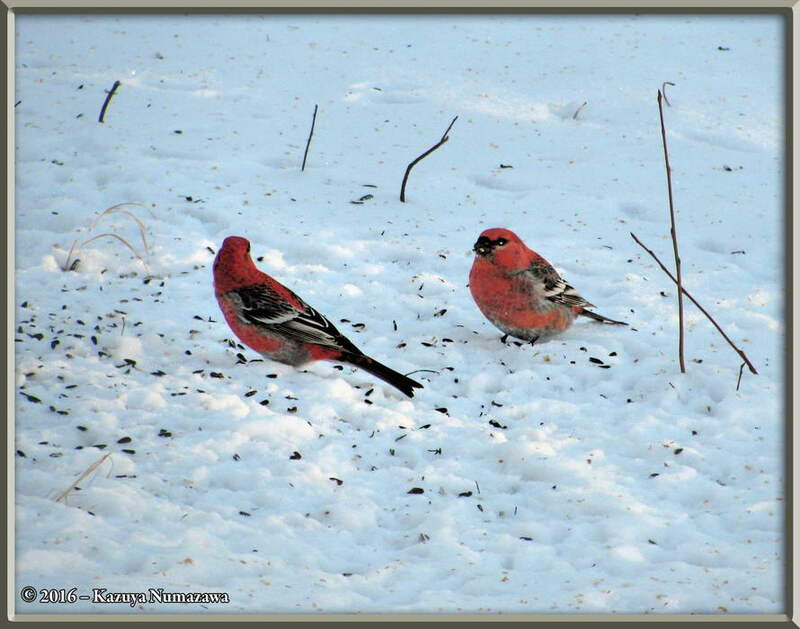 Here are three more shots showing male Pine Grosbeaks (Pinicola enucleator). 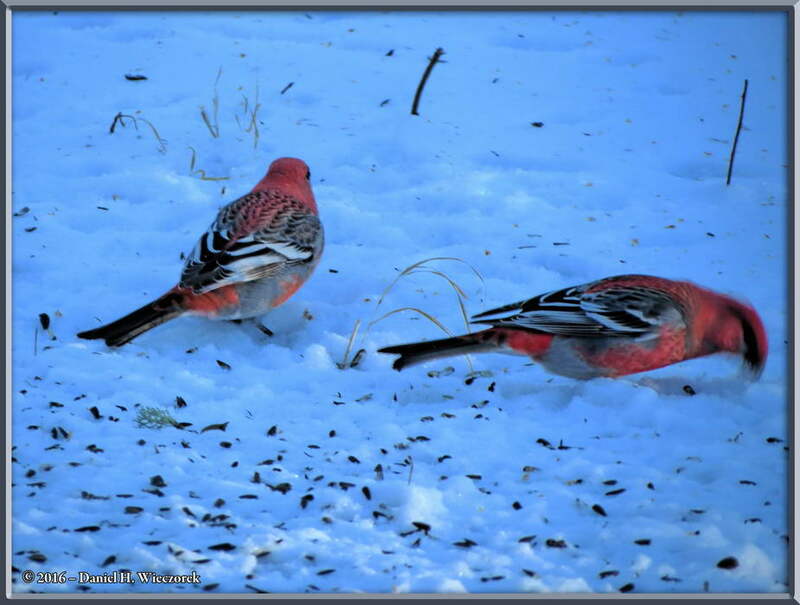 And three more shots of Pine Grosbeaks (Pinicola enucleator). 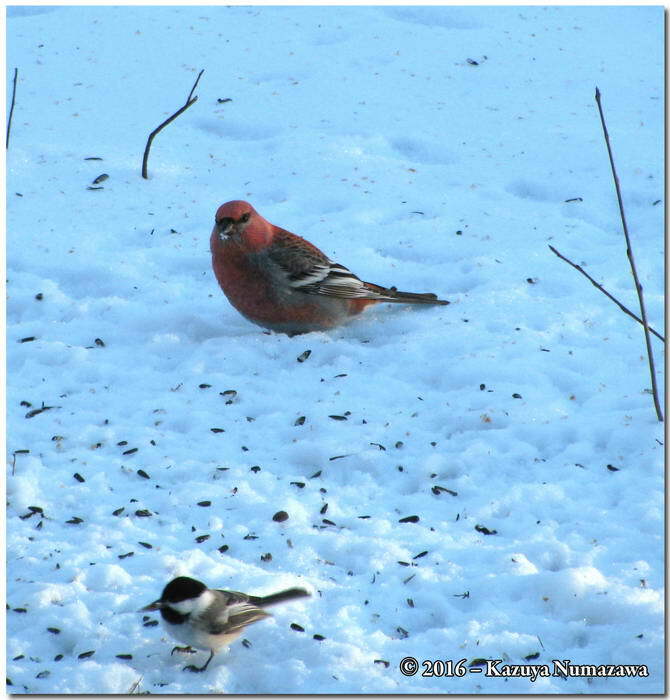 Notice that the center shot also includes a Black-capped Chickadee (Poecile atricapillus). 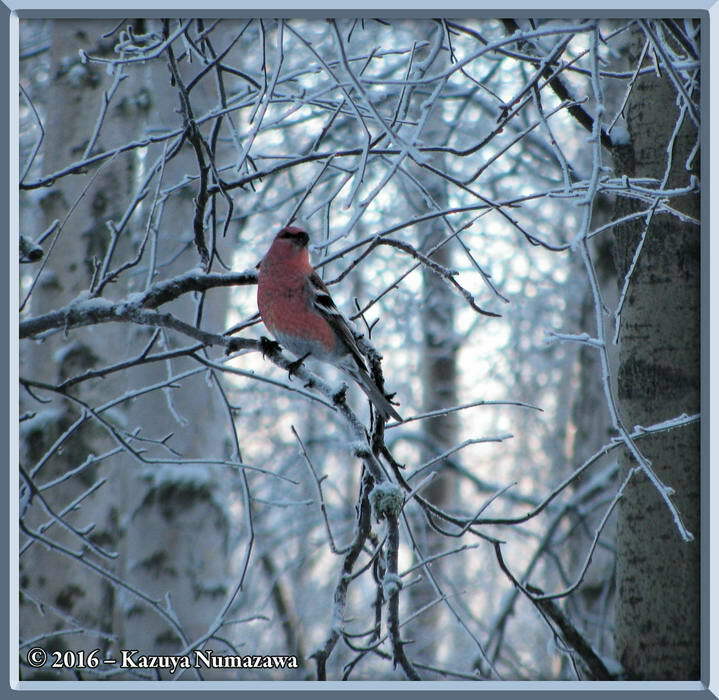 This shot of a Pine Grosbeak came out very nicely. 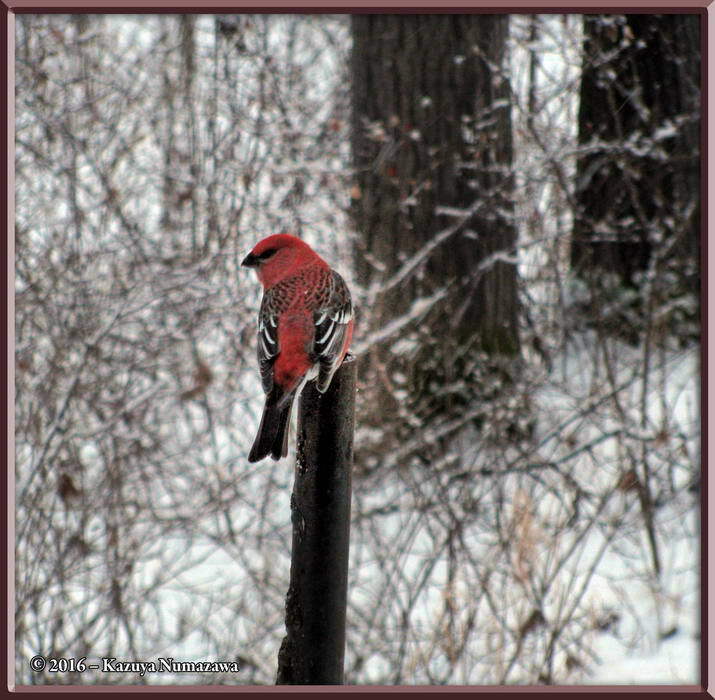 I drove this iron pipe into the ground and at this point I was in the process of making a platform feeder which will sit on it so that the Pine Grosbeaks can have their own feeder without having to spend all of their time on the ground searching for seeds dropped by the Chickadees. 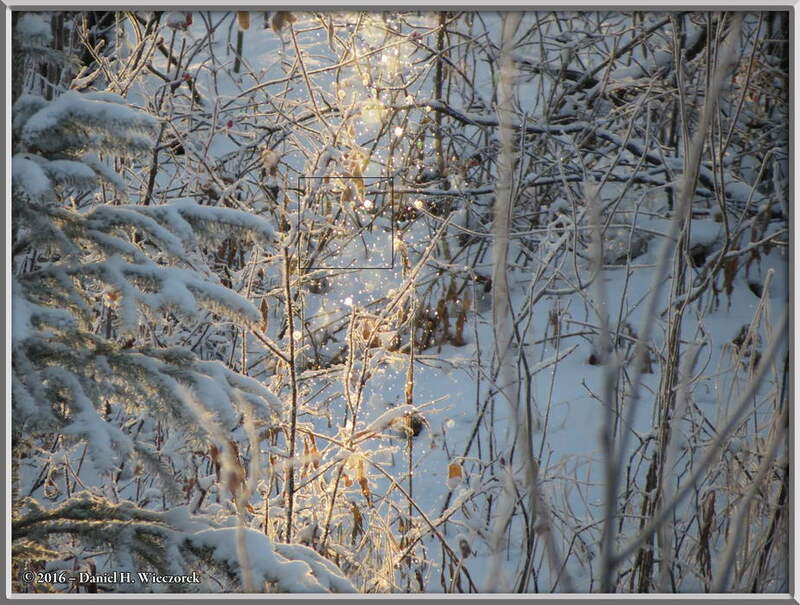 In the late morning of November 17th I looked out the south window into the rays of the sun coming through the trees and saw what looked like ice crystals floating gently through the air. 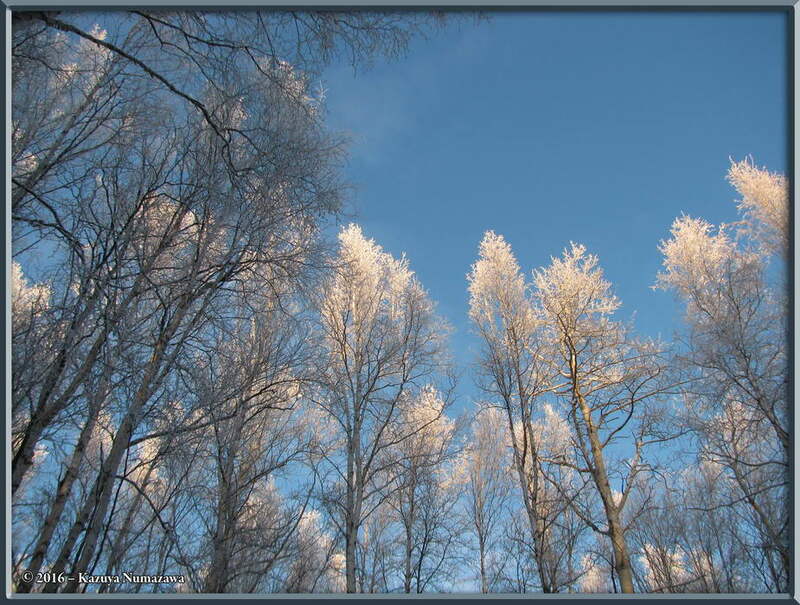 In the first photo here these ice crystals are nearly impossible to see. In the second photo they are quite evident. 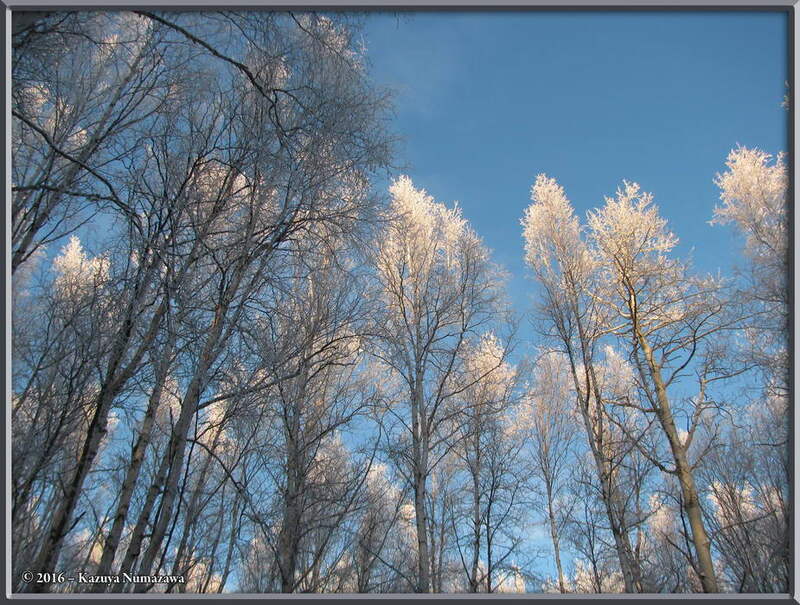 The outlined area of the second photo has been cropped out and the full size version of it is shown in the third image. 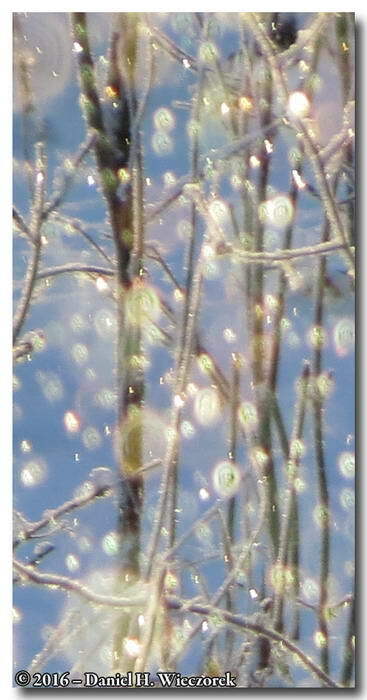 In the third image you can see that the little floating "ice crystals" are not crystals at all, but just little round blobs. Wonder what these are called, anybody know? 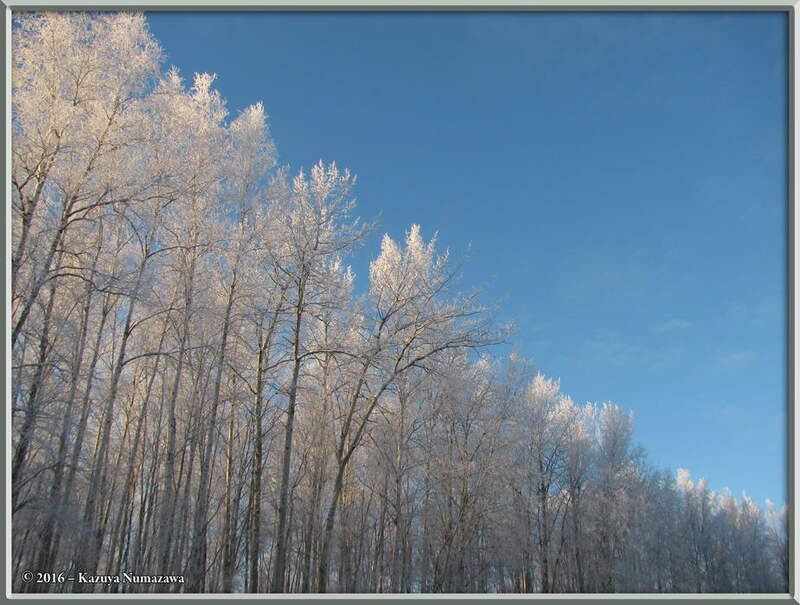 Here are three more images of the ice blobs in the air. Again, please note the outlined area in the first photo. 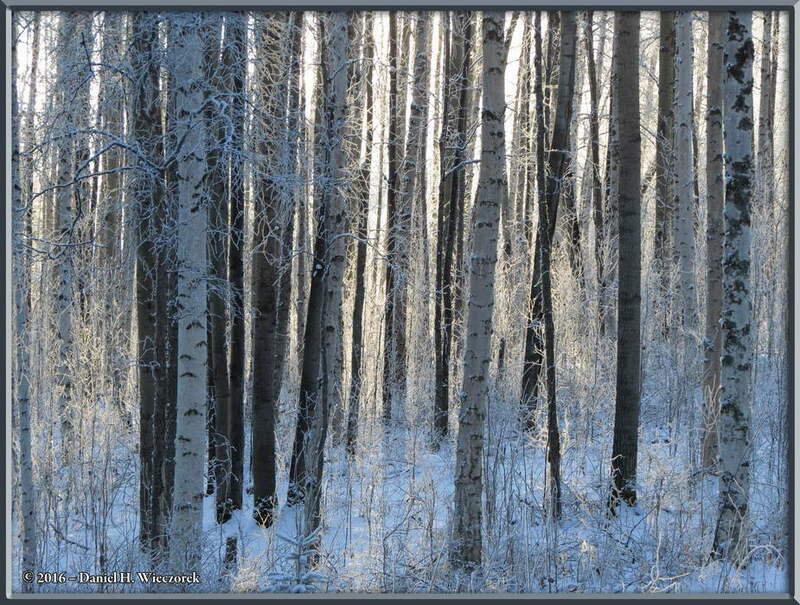 This area has been cropped out and is shown full size in the second image. 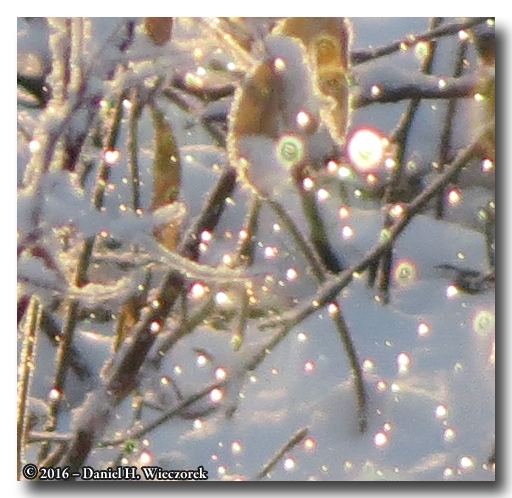 It is again obvious that they are not "ice crystals", but just little ice blobs. 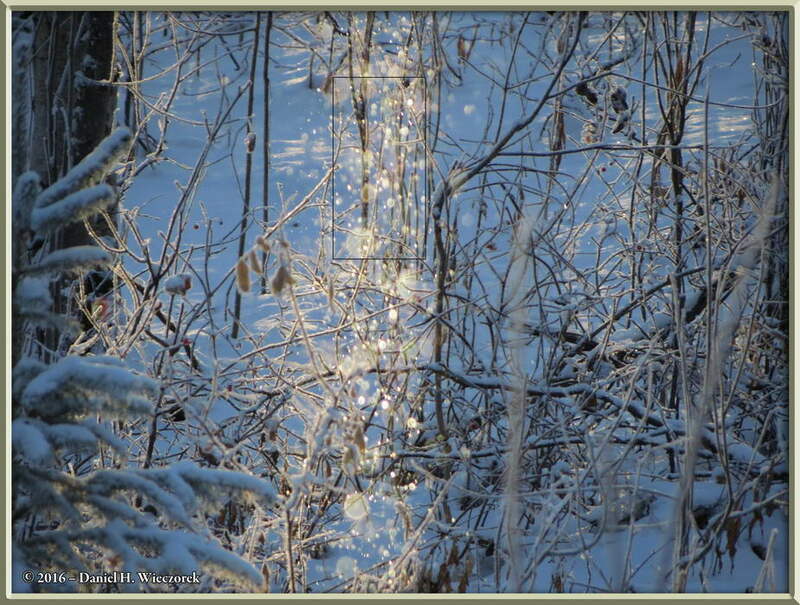 In the third photo you cannot see the ice blobs, but they are still there. 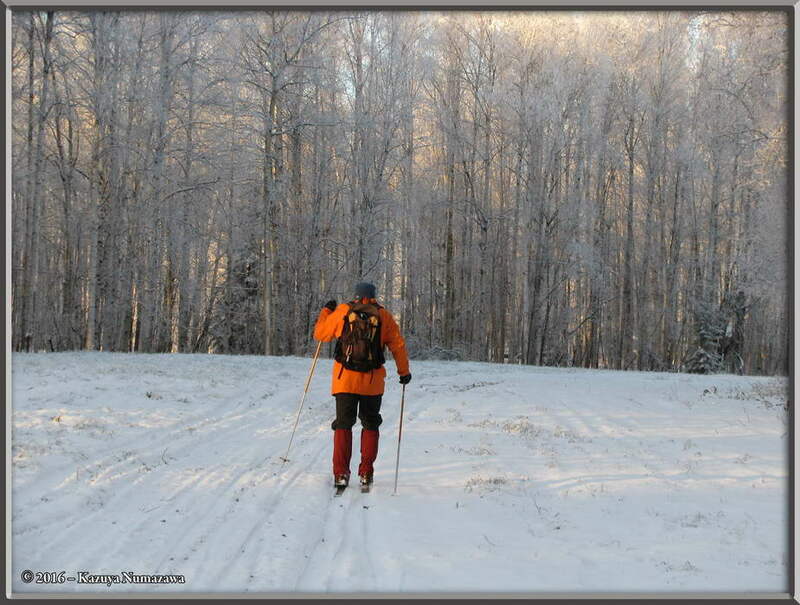 In the afternoon of the 17th we went out Cross-Country skiing, starting from our porch. These two photos show the beauty we were allowed to see on this date. 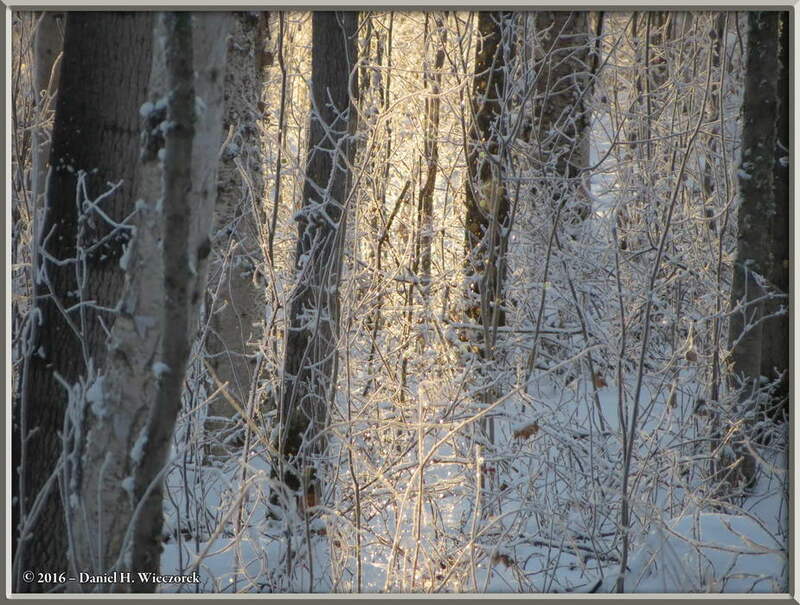 Here are two more shots that were taken while we were x-c skiing. The second shot is me. 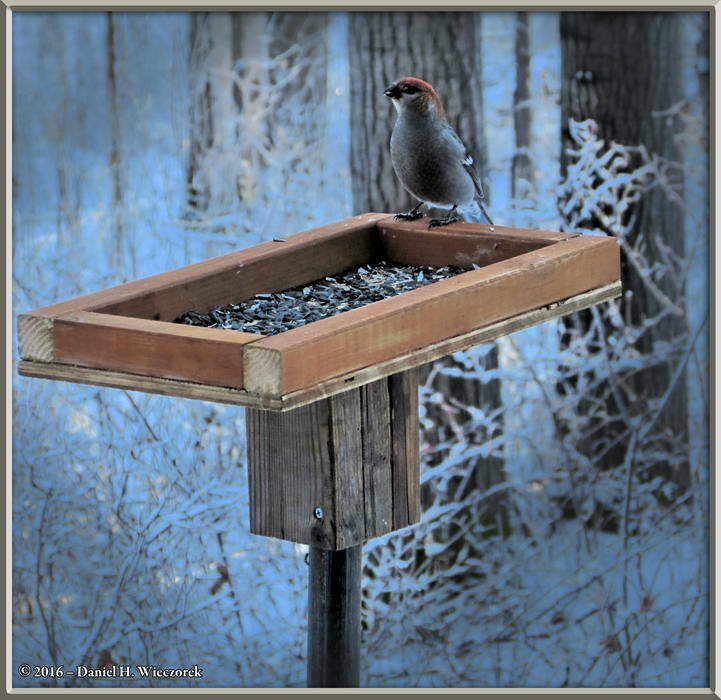 On the 18th I had completed making the platform bird feeder for the Pine Grosbeaks (Pinicola enucleator) and got it up on the iron pipe shown above in Row 4. 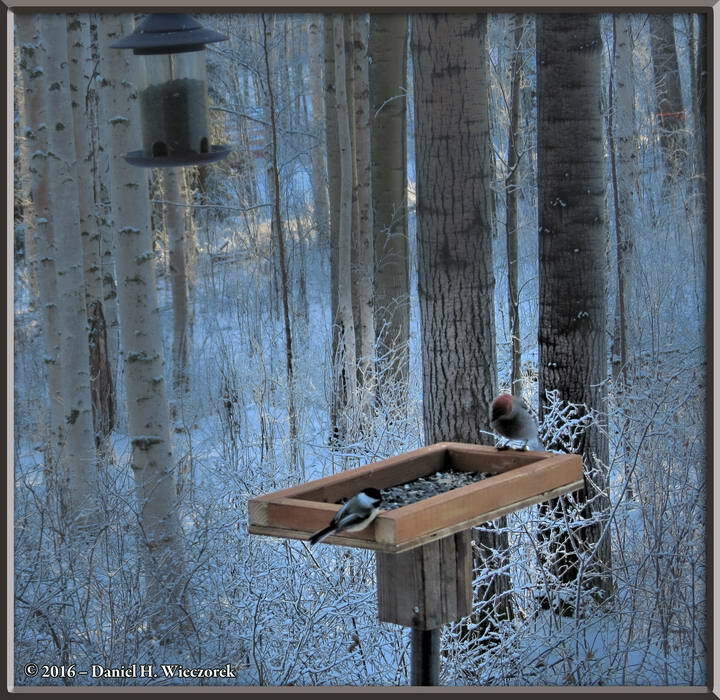 The first shot in this row shows a male Grosbeak sitting in a tree getting ready to come down and feed. 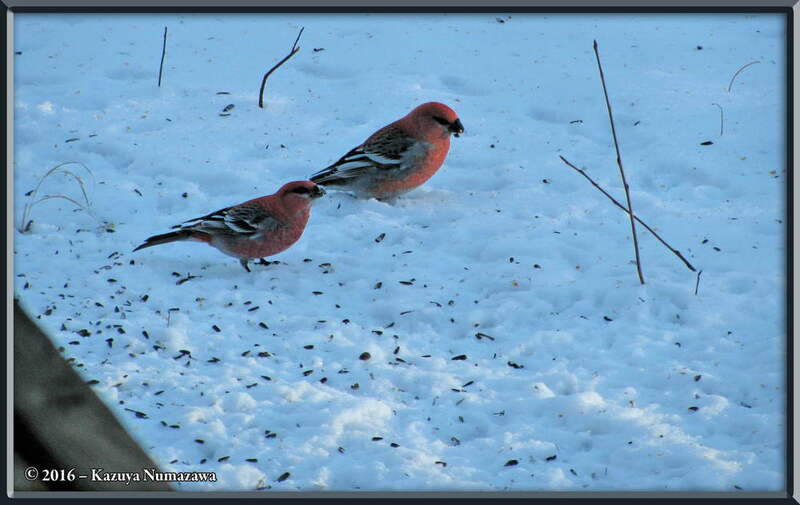 The second and third shots show a female of the species. 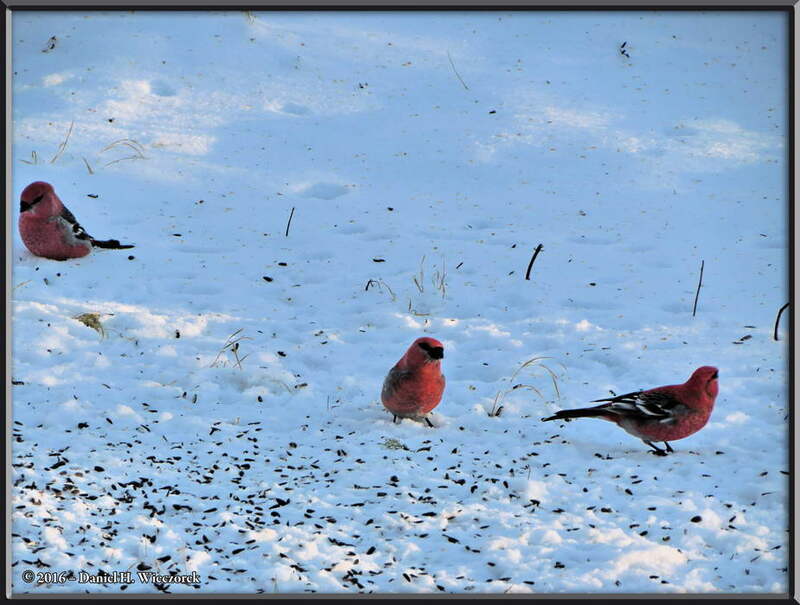 All three shots in this row show either a female or a first-year Pine Grosbeak (Pinicola enucleator), from the colors I cannot be sure which. 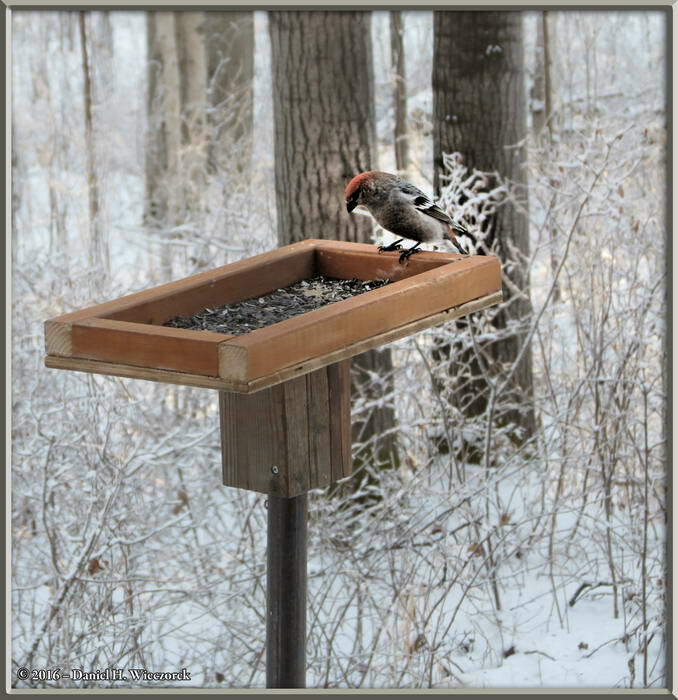 The center shot shows that the Black-capped Chickadees (Poecile atricapillus) also feed at the platform feeder. They do, however, seem to prefer the hanging feeder.